If you are a parent, this may have a little more meaning for you, but everyone was a kid once. Unless you were homeschooled, you had to endure the business of "school lunch." You were either one of those brown-bagging kids or the kids that got money for lunch. Maybe you were lucky and had a choice. How do these early habits translate into adult life? Do you still have the habit of bringing your own lunch, or was doing so as a child so traumatizing that you refuse to bring a sack lunch even now? If you got money for school lunch, are you still in the habit of buying every day or have you switched over to the "brown" side? Oh my, I feel a poll coming on. And it's not even Sunday. For your answer, select what you predominately did/do for both. I'm interested to see (in this highly scientific poll, I might add) how early influence affects your adult behavior. If there's any correlation, then it could be argued, much to the chagrin of parents who provide lunch money, that sending kids to school with a bagged lunch might be setting up better healthy eating habits later. Of course, if you pack the same nasty stuff they provide at school, then I guess it's a wash, but at least when you're old enough to pack your own food, maybe you'll make decent eating choices. And, you might remember to pack leftovers to save food waste! And don't forget to use a reusable lunch bag. Do you have any sack lunch food memory items that don't exist anymore? All my friends had cool "Strawberry Shortcake" or "Scooby Doo" or "whatever-the-hell-was-cool-back-then" lunchboxes and I had a super-gay maroon colored Tupperware 'lunch tote' with like, 14 individual snap top lids that were im-freakin-possible to open. I hated it. I wish I still had it though. It'd be cool now. Ops, messed up my own name :D Ali was supposed to be Alina. Sorry! There were 3 of us at one point who got bagged lunches, including my dad. We all had IDENTICAL ugly pink and yellow lunch bags with the smaller compartment for the juice box. If that wasn't bad enough -- because these lunch sacks were too big to fit in our backpacks...they were numbered so we knew which one was ours in the morning. Yeah, not cool! I have since converted to a Bazura Bags lunch sack. check out www.bazurabags.com for more info. They're made from recycled tetrapak juice boxes. We didn't get that highly processed stuff like Twinkies (thank goodness) but I remember occasionally talking my mom into getting me the freeze-dried ice cream. Same as the astronauts' ate! I had a metal lunchbox with rocky & bullwinkle on it - it was 1974! I my mom used to freeze a little milk in the bottom of the glass lined matching thermos and fill it up the rest of the way in the morning. When my dad took his navy retirement in 1979 he started baking bread and making wooden roll top breadboxes for craft fairs. I remember sitting next to a friend who's mom baked their bread and we would want wonder sandwiches - because homemade organic wheat bread just didn't look the same. Lucky for us the breadbox business didn't take off and dad found a 'real' job which meant wheat home pride butter top bread for sandwiches. Now I have a 2nd grader who REFUSES to buy lunch - no matter how late we run some mornings. He says its gross and wants me to pack his lunch daily - same thing every day. And they offer a great bagle plate too! I understand the food isn't terribly great quality at our school. However I do know it is meeting the free lunch guidelines the gvn't sent, and a sad fact is those overcooked veggies might be the only ones some of those kids get in a day. Lets get them a veggie to eat and then worry about the veggies' carbon footprint. All that said - I do take my lunch with me if I know I'll be out all day on errands or such. Hubby will take leftovers if I pack it for him and he isn't going to be on the road with customers at lunch. In elementary school it was either brown bag it or go home for lunch. In secondary school (grades 7 to 12) we had a choice between cafeteria, brown bag or go home. I always got cash for the cafeteria because you coulnd't possibly make up as good a lunch for that price. It was always quite balanced with starch, protein and vegetables. For $2.10, I got a meal and a juice box (with real 100% juice), I could then splurge 0.60 for an ice cream sandwich, fruit salad or jello. There was no snack bar type food, you coulnd't buy chips, pop, fries, hotdogs or other junk, there was also no candy of any kind, aside from expensive fundraiser chocolate. For junk, you had to walk 10 minutes to the only fast food outlet in this otherwise residential neighbourhood, a Burger King. In elementary school, I usually bought lunch becasue I HATED peanut butter and jelly sandwiches. They always got soggy and squished. I usually hated the mystery meat, too, just not as much. In high school, for some reason my high school didn't have a cafeteria. Well, they had a place for us to sit, but no hot lunch plan. Occasionally, a club would sell bagels or pizza or whatever, but often there wasn't really an option. At that point in my life, my mom had made me responsible for making my own lunch. That just didn't happen. What she did was give me $2 a day - $1 to pay the upperclass girl who drove me to school (I lived 45 minutes from my school and it took over 2 hours to get there by bus, which I had to do pretty often, too) and $1 for lunch. They did have vending machines at school. I think my standard lunch was a 55 cent chef boyardee ravioli from the vending machine, and a 50 cent fresca. I had to pilfer the nickel from my dad's change bowl. How sad is that? When I worked, I always brown-bagged it. Now, I'm home with the kiddos, so we make lunch :-) And I've resolved to make sure my kids get better meals at school than I did as a kid! For most of my work career I've brought my lunch because I hate having to chase around to go buy something and few of my jobs had a variety close by. My current job has a really good cafeteria, so I had been buying my food more often, but I recently learned I was gluten-intolerant so there aren't that many choices I can have. I'm trying to bring my lunch more often to eat healthier and have less risk of gluten contamination in my food. There is an interesting article on the national school lunch program here. After payroll, overhead and food costs, school cafeteria managers have 72 cents per student to spend on each meal. No wonder so much factory farm crap ends up on the school lunch menus. We always send a brown bag lunch with our son to school. True story--my mom wrapped everything in tin foil (aluminum foil) individually and put it in my lunch box...even my milk money! I could have been the friggin' Tin Man from the Wizard of Oz for Halloween if I'd saved up all the foil she sent. Everyday, I opened my lunch and there was a sandwich wrapped in foil...2 cookies wrapped in foil...fruit wrapped in foil...and a little bundle of foil with a dime and a nickel in it for milk. I thought she was some kind of foil freak. I have a few memories of lunch. My earlier memories are that when my mom packed it, my sandwich meat or cheese would "sweat". Since our lunchboxes were never refrigerated at school (and I truly don't remember, but I have a feeling mine did NOT contain an ice pack other than my refrigerated juice box or thermos), it seemed my sandwiches would have already started to decompose by the time I was able to "enjoy" them. Bologna, ham and cheese, peanut butter and jelly, egg salad - it was all the same - mushy, lukewarm, and stinky by the time I got to it. But aside from the "sweaty" meats and cheeses and some slimy peanut butter episodes, I was always grateful for it and overlooked the physical grossness in favor of a full belly. This was before I knew about bacteria. And nitrites. On the other hand, buying lunch was disgusting, and I recall lamenting the days my mom gave me money on the *wrong day* (Mexican pizza day instead of hotdog day, for example). (Blech on both accounts, these days.) Those days I pretty much survived on chocolate milk, ice cream, and fries (or tater tots). High school was worse, though, since I nearly always brought money to school, rarely had the luxury of a real lunch period, and often used my money to buy cookies, donuts, and soda - typical contemporary-American-teen diet. Gotta give moms credit, though: kids can be truly picky eaters, and it's tough enough planning a meal to meet the nutritional needs and taste buds of the entire family without having to figure out how to pack it all up - in advance - to be enjoyed hours later. Props to moms for keeping us fed, one way or another! Leftovers make the best lunches ever. Yum! I didn't have a choice about eating school lunches; my mother refused to let me take a lunch even if I made it myself. And the school lunches were just hideous. Gristly beef in stew, white beans with gristly ham, chili without any chili flavor (bean soup, in other words). Most days I could only eat the bread roll and salad. This of course was in the days before the junk-food explosion in school lunches. I almost always brought lunch to work (retired now), especially after I showed up with celiac disease and couldn't eat anything with wheat. Mostly this was food in plastic tubs that I microwaved. Sorry now that I nuked so much plastic every day, but there it is! I don't do that any more. I was told to have school lunches until one fateful day in the 3rd grade when the *hot* lunch was spilled all over me. I think I had my own lunch, or skipped lunch, every day after that. In high school, I'd always try to get off campus and get espresso for lunch... Now... Some days I bring a lunch, others I am lucky to run out the door with my wallet and a coat. I keep a stash of granola bars in my desk just in case I forget and can't buy lunch. I brown bagged when in school and I brown bag now. I've always moved around alot. When I lived close to school or work, I went home to eat lunch. Or had someone bring it for me(like a maid servant). When I live far from work or school I brown bagged lunch. Eating at the cafeteria has always been rare - both in school and now. Junk food has been pretty much non-existent during my life so I never had that stuff. It could be a habit...but I am also fussy about food. I want to eat good tasty meals every time and home cooked meals are made to my liking. I doubt they let kids out these days, but my school didn't have hot lunch. Brown bag was the only option, or to go home. I ate hot lunch at school and hated it. There were a couple of things that were OK, but man, it couldn't have been good for us. Though, I doubt my mom knew enough at the time to pack us anything better. Before I homeschooled my daughter, I always sent her with a packed lunch. Some days were better than others, but for the most part it was pb&j (on whole wheat), fresh fruit and some sort of whole grain snack (granola or crackers). Now that she's home we eat leftovers. I never thought about a correlation, but I was definitely a "hot lunch" eater in school and now prefer to buy something wherever I am to eating a cold homemade packed lunch. My mom was a terrible cook, and I loved our school's food. Maybe it was better than other places! Or maybe I just had a low standard because of my mom's cooking. I love having other people (even in restaurants) cook for me because I think it makes me feel loved. My mom's lack of cooking made me feel neglected (she did work full time, I can't blame her and as an adult I understand...). Nowadays, I work at a natural foods co-op so I have the best of it all. I get to eat homemade organic soup and other foods for lunch! One triumph however, my kids prefer packed lunches. They wouldn't eat school food if I made 'em! Thanks to the cooking of both my husband and I, they know much better food than I did. i remember both being on the free lunch program (and thus eating a lot of school-provided food) and having lunch boxes and bags and taking lunch a lot. the school food was generally "ok" in my kid-mind. chicken nuggets and mashed potatoes day was a favorite, as was grilled cheese sandwich and tomato soup day. favorites that my mom packed for me included cream cheese and jelly sandwiches, or cream cheese and cucumber sandwiches. we didn't so much do lunch meat. now i pack my lunch most days. i used to make a huge pot of chili every sunday (for about six months straight i ate chili EVERY DAY for lunch), but now it's mostly leftovers plus a fruit. summers are easier when i can slice up tomatoes and a cucumber, add some feta and call it lunch! I used to pack ramen noodles in a thermos. Getting to eat soup at lunch was awesome, being teased not so much. I always had to pack my own lunch and my brothers lunch, my mom wasn't domestic like that. I was lucky enough to be able to eat lunch at home from elementary all the way through high school. My mom would make all of our lunches and they were always tasty and healthy. I'm sure this is part of why I really don't like to go out for lunch much anymore because I just don't want to be spending 7-8 bucks for lunch everyday when I can make my self a good lunch for 2-3 bucks, if that. Wow, my first response was to say, no we never had anything like space sticks. Then I watched that first commercial and the whole thing came flooding back. Yes we ate the chocolate ones and I *think* they were good. I can't really remember though. Mostly I had cafeteria food growing up. Now we pack our kids lunches, except Friday is pizza day at school so they buy on Fri.
At my elementary school there was no cafeteria, and few kids went home (it was Catholic school so they came from all over town). Instead, we enterprising young children developed a whole Trade Economy based on what was in your lunch box. My mother made fantastic chocolate chip cookies - she *never* packed any processed food. But we did get tired of cookies and longed for Twinkies and other Hostess treats that were forbidden to us. Mum's cookies were worth gold on the lunchtime food market and could be traded for the highest-prized items. I had a Scooby Doo lunchbox and was stunned when first presented with it. We had a black and white TV and I didn't know that Scooby was bright orange - I thought he was grey! When I worked outside the home I paid for my lunches b/c I am not at all organized and I had no financial sense back then. So I guess I count as one who had an excellent example at home but didn't follow it. Now, however, I never go anywhere without snacks and water packed. And if we're going to be out for the day I always pack our lunches. It's a combination of wanting to eat well and save our money for better things. I'm afraid I have no fancy environmentally-friendly tools for this. Just a reusable cloth grocery bag and a bin full of tupperware! I brown-bagged it as a child and do both at work. And my family was part of a focus group that tested the freeze-dried ice cream back in the sixties. We drank a lot of Tang back in the day too (because of astronauts, of course). I was on the free lunch program and the food was really gross -- soggy pizza, lethargic veggies, corn with every meal (as if we were in Kansas instead of Kentucky). Luckily the spices in the school sausage made my eyes swell shut, so I got to skip the bracing school breakfast. Our bus usually didn't make it in time for the breakfast, anyway. I always come home from work for lunch, if I'm not eating out with a friend. If you find someone who is willing to get the sushi special with you, you really have to take advantage of it. My mom always packed the worst lunches. It usually consisted of a ham sandwhich with no lettuce or tomato and enought mustard to take care of the hot dogs at any baseball game. I also got an apple that was usually mushy. I did get to go home for lunch too and that was better. Sometimes I could con our ironing lady into making me french toast. In High School, we had a culinary vocational program and the food was pretty amazing. My experiences have influenced me as to how my daughter eats lunch. She almost always brown bags it. and she has a sandwhich of her choosing, a veggie and a fruit. She takes water and she seems to be happy with that. Pretty amazing for a 7th grader. I do have to admit that I always pack something fun and unhealthy for field trip days. She seems to really appreciate it and it makes the day more special. Her school has gotten much better about recycling. Bins everywhere and the kids are using them. "(as if we were in Kansas instead of Kentucky)." Umm... we actually grow mostly wheat, not corn. Anonymous -- KS v Kentucky was supposed to be a play upon alliteration, not a factual comparison of agricultural production. My apologies for attributing corn to your wheat-producing state. I made my own lunch and made my dad's, too, everyday. He had a physical job, so he got two sandwiches, and I had a sandwich assembly line. I used to spell out the names of the boys I liked in mustard. I brown-bagged in school and canvas-bag now. When I was a teacher for a time in TX, I saw that the school lunches have declined in quality since we were in school in the 80's. The "veggies" consisted of either fries, a garnish cup (iceberg, tomato slice, pickles) or some canned fruit. Many many students ate pizza and fries daily for lunch. No hot food available, unless you consider nachos (chips + cheese, no veggies or beans) hot. Amazing for a school district hard hit by the obesity/diabetes epidemic. 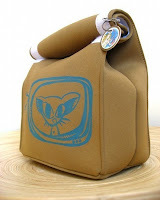 I had one of those soft side insulated bags elementary through high school. Now I just reuse something like the bag my bread comes in. But yes, I did and do pack lunch every day. Similarly, dinner was always something my mom cooked. Now, I only eat out or get take-out if its an evening with friends. I loved the idea of Space Food Sticks more than the sticks themselves which had a weird texture. They were the only pre-packaged things Mum put in our lunch boxes. I think I was traumatized my first day of Kindergarten. I was sent with money and the lunch was something that was awful. The lunch room monitor told me I couldn't go out for recess until I ate everything. I sat there and cried and cried. My Grandma took me out that afternoon for my first lunch box. It was a blue plastic Snoopy. I carried it all that year with my lukewarm bologna sandwich on white bread with Miracle Whip. A few Cheetos on the side and I think she would put Coke in the thermos which of course was flat by the time I drank it. I never forayed into lunchroom eating again until I was in 4th grade. My school then had awesome food. Then we moved and I don't think I ate cafeteria food until high school. And then it was usually something out of the vending machine. Does anybody remember Koogle? I think the closest I can describe in sort of peanut butter. That was really big in the 70's. I had to eat school lunch until 5th grade. My mom was not going to get up in the morning. Then when I started junior high, my Dad kind of forced/encouraged her to make my lunch. The reason was our school district had one cafeteria. They would make the meals and then drive 30 miles with them in a heated trailer. My dad never could figure out how that was sanitary. By the time I got to high school I was making my own lunchs. I was always grateful to my dad for finally letting me take my own lunches. Although I did like cherry cobbler day and prune day. Oh well, guess I've always been an old person in a young person's body! And now, I'm too cheap to buy my lunch. Most times my husband and I "brown bag" it. I had a Dawn Doll lunch box. The kind that was made from vinyl-covered carboard. And a matching Thermos with glass inside. My mom was constantly worried I'd break it and die from drinking glass shards. She packed Wonder bread sandwiches with American cheese and Miracle Whip sometimes. Ho-Hos that came packaged in foil rather than plastic back then. Sometimes a smaller Thermos with Spaghetti-O's or Chef Boyardee beefaroni that came from a can, not a plastic microwave cup. There were 4 kids in school at the same time, so we each got to choose 1 day a week to buy lunch. My favorite bought lunch days were spaghetti or cheeseburgers. My least favorite was anything to do with baked beans. I couldn't eat peanut butter and jelly sandwiches again until I was forty. And my mom went through a home-made bread and a carob-only phase, and now I'm doing the same thing to my kids! Just rerunning those old tapes, doncha know. Where's a Lil Debbie snack cake when you need her? I miss my Ding-Dongs. I have to go to Seven-Eleven now.